This modern flat by Sonderland Apartments has 3 bedrooms, a living/dining room area and a fully equipped kitchen. It can accommodate up to 9 guests. 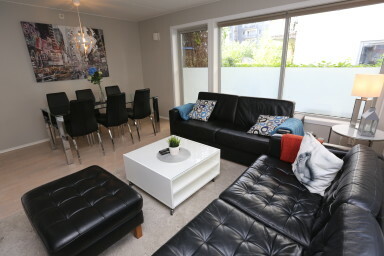 This apartment has a living/dining room area with a flat screen TV, a sofa, and a sofa bed for 2 guests. There are 3 bedrooms, containing 7 single beds. A crib is available upon request. It has an open kitchen equipped with kitchenware, a stove top, oven, fridge and freezer, a dishwasher, toaster, microwave and a coffee machine. The bathroom has a shower and is equipped with a hair dryer, an iron, a washing machine and a tumble dryer. It is located on the ground floor, with a small seating area on a terrace. It has access to the garden and the children's play areas outside, in the common grounds of the building. There is free Wi-Fi. Linens and towels are included, but we do not provide shampoo or food items. The supermarket is only one block away. The Oslo Bus Terminal is a 6 minute walk away and 10 minutes to the main train station. The subway station, tram and bus stops are a couple of blocks away, as well as cozy cafes and restaurants. Karl Johans gate, Oslo's main street with shopping and dining, is a short 15 minute walk away. An indoor parking space is available against a fee, please contact us for vacancy first. Please note the garage is 2.1m tall. Please inform us of your expected arrival time in advance. We will be there to meet you, show you the apartment and give you the keys. The minimum age to check-in in this apartment when not travelling as part of a family is 24 years old. Please note that it is strictly forbidden to have parties in the apartment. This property will not accommodate bachelorette/bachelor or similar parties. These apartments are located in residential buildings and a strict minimum noise policy is enforced at the building after 22:00. If you expect to check-in after 10:00 pm, please contact us first, and note that we charge NOK 250 for late check-ins.